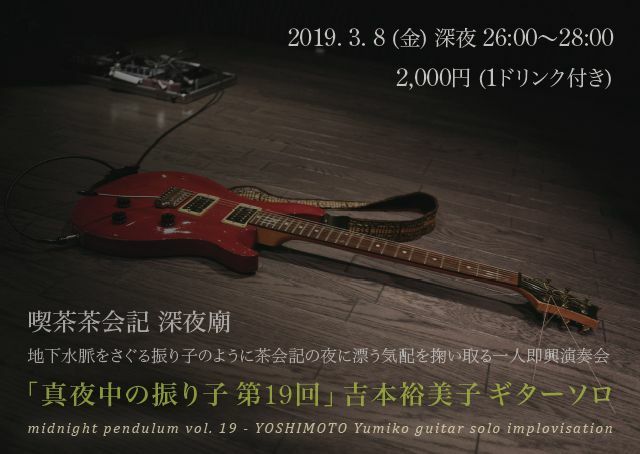 YOSHIMOTO Yumiko (guitar) solo improvisation "midnight pendulum vol.19"
Born in Tokyo, Japan. After played in some rock bands, started free style guitar improvisation in 2006 as participating the performance of visual artist, HIGUMA Haruo. Since then performed as solo, with other musicians, and also with dancers, poets, films etc in 15 countries, over 30 cities in Europe and Japan. 2017 Apr. start to play daxophone (instrument invented by German guitarist Hans Reichel).